Posted on 22 January 2014 under Civil Rights & Martin Luther King, Jr., History, Theory. Sometimes, in the midst of protest marches, a feeling springs up unawares, a feeling that Martin Luther King’s last dream can never die. His visionary dream of a Poor People’s Campaign remains an unsurpassed blueprint for the edifice of human rights we are still waiting to construct, the resurrection of the Dream. For many years, everyone from well-meaning educators to White House officials has called on Americans to honor the spirit of Martin Luther King, Jr., by volunteering in community projects such as fixing up schools and community centers, removing graffiti and collecting food. These various proposals for a day of volunteerism to honor the civil rights leader fall tragically short of King’s dream of economic and racial justice, and an end to war. For, in his last days, Martin was on the move to Washington, D.C., not to participate in a feel-good photo-op at some community renovation project, but rather to launch a showdown with the federal government — a government that, even under the leadership of liberal Democratic Presidents Kennedy and Johnson, had refused to remove the burden of poverty from the backs of the poor. King was slain at the very moment that he was organizing a massive army of poor people who would march on Congress and the White House and use a militant strategy of nonviolent resistance and civil disobedience to force the federal government to enact an Economic Bill of Rights for the Disadvantaged. His last and most daring dream was a Poor People’s Campaign to win full employment, affordable housing for all, a decent income for those unable to work, and equal educational opportunities for the poor. He championed a massive public works program to rebuild the dilapidated housing of the inner city by those who lived there, providing jobs, training, and housing in a coordinated effort. King was assassinated on the very eve of organizing poor people into an army of unprecedented size, trained to disrupt the functions of the federal government until the nation acted to grant the Economic Bill of Rights for the Disadvantaged. This dream of a nonviolent insurrection led by the poor and dispossessed is light years beyond the way our nation has chosen to honor a radical and even revolutionary leader with feel-good anniversaries that diminish King’s true stature and significance. To truly honor the dreamer, we must recall the true dimensions of his dream. King did not call us to hold a day of volunteerism; rather, he called on us to build a nonviolent movement so strong that it could disrupt the federal government itself. Rather than a day of service, King called us into a life of fighting relentlessly to win housing, jobs and health care for all. To this day, the blueprints for this poor people’s insurrection remain the most visionary and brilliant strategy to overcome poverty ever put forth in our nation. 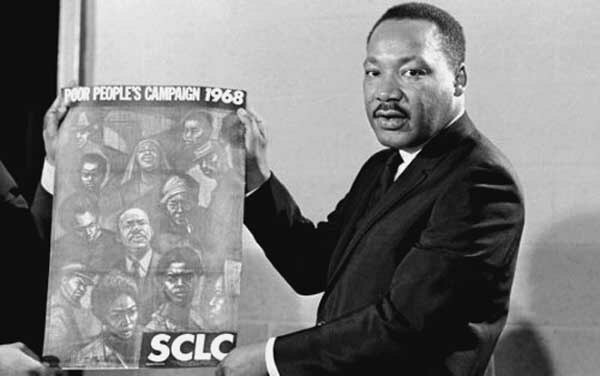 In organizing this campaign, the Southern Christian Leadership Conference (SCLC) had designed a carefully detailed strategy for a prolonged effort that would train poor people in 10 different areas of the nation in the techniques of “militant nonviolence.” The intention was to create a nonviolent uprising, a multiracial coalition of poor people and their allies who would march to Washington, D.C., set up mass encampments, and then launch protests every day for economic justice. In 1965 and 1966, Rev. King brought the brilliant organizing insights of the SCLC to the slums of Chicago to confront the evils of racist, exploitative landlords. King moved his own family into a rundown housing unit in Chicago’s notorious Lawndale slum (renamed Slumdale by its occupants), where they endured for a time the harrowing poverty, squalor, and overcrowding that other slum residents had endured for decades. King and the SCLC organized huge marches for fair housing, and conducted systematic rent strikes where residents of many dilapidated buildings banded together, and refused to pay rent to the slumlords. Instead, they pooled the rent money to make building repairs themselves. With a daring audacity too little seen in today’s movements for economic justice, King crossed swords with capitalism’s central decree that property rights are sacrosanct. Who among us today is capable of dreaming such an audacious dream and seizing entire buildings from landlords and property developers? Unlike today, when well-meaning housing advocates and liberal budget policy groups try to prevent further cuts to the already shredded safety net by politely lobbying and emailing Congressional representatives, King had the audacity to organize a multiracial coalition of poor people who would confront Congress and the White House in a daring showdown — a nonviolent insurrection in the nation’s capital. And that is what King was doing when his last day dawned — preparing to defy the whole might of an unjust United States empire that mercilessly oppressed its poor citizens, then and now. After months of training in the discipline of nonviolence, the Poor People’s Campaign was preparing to march on Washington, D.C., and erect shantytowns near the White House to make poverty visible to the entire nation. Then, the encampment — known as Resurrection City — would become the organizing base to launch a campaign of massive sit-ins at federal agencies. King openly declared that his call for massive civil disobedience was aimed at disrupting, and ultimately paralyzing, the functions of the most powerful government on earth, unless and until it granted the Economic Bill of Rights. King planned to erect shantytowns for tens of thousands of poor people, prefiguring the tent cities and squatter encampments set up by homeless activists today. The shantytowns would make the suffering of economic deprivation so visible that federal legislators — and the American public — would be forced to see the grim reality of poverty all around them in Washington, D.C.
Shantytowns in the very shadow of the Washington Monument would burn the shame of poverty into the nation’s conscience as never before. Then, once these encampments had forced all America to confront the national disgrace of joblessness and poverty, stage two would begin — a more militant phase of nonviolent resistance. If Congress and the White House still refused to take actions to lift the load of poverty, the Poor People’s Campaign would organize waves of protesters who would cause “major massive dislocations” at government buildings. Unemployed people would nonviolently blockade the Department of Labor. Those without health care would be organized to sit in at hospitals and refuse to leave until they received medical treatment. Massive demonstrations would be held at federal agencies, while across the nation, allies would mount economic boycotts and nonviolent shut-downs of factories which refused to hire the poor. Federal officials and the FBI were frightened by King’s announced intentions to lead a campaign of civil disobedience on a scale that could disrupt the nation’s capital, and they denounced King with blistering venom. Negative leaks, disinformation, informants and provocateurs were just some of the tools used by the government to derail the effort. King had developed a strategy to confront the federal government with the same unwinnable dilemma earlier perfected by civil rights activists in Alabama, Georgia, and Mississippi: Either arrest innocent and poverty-stricken people by the thousands in the full glare of publicity in the nation’s capital and thereby create a national scandal, or capitulate to the just demands of those calling for an Economic Bill of Rights. But it was not to be. King was murdered on April 4, 1968, just as the Poor People’s Campaign was getting off the ground. Long a prophet, King now became a martyr as well. Rather than the carefully planned civil disobedience that King was organizing, the United States erupted in riots and civil unrest in over 110 cities following King’s murder. While the SCLC continued the campaign in the wake of King’s death, and got as far as building Resurrection City in Washington D.C., the despair, riots and governmental repression that followed his assassination seriously undermined the dream of massive nonviolence. While more than 7000 people started the encampment in May 1968, and more than 50,000 joined in protest marches, the encampment was torn down in late June by police order, the promise of mass civil disobedience unfulfilled. King had predicted that the Poor People’s Campaign would be a turning point in American history, a chance for the nation to redeem itself from its legacy of poverty, racism, war, and exploitation. Instead, the dreamer fell and his dream of justice was assassinated. Can the dream of a Poor People’s Campaign be resurrected? It won’t be revived by creating monuments of marble in Washington, D.C., or by holding “days of service.” But King’s dream does come back to life every time any one of us sets out and marches in Martin’s footsteps to confront and overcome the inhumanity of poverty, unemployment, and homelessness. St. Mary’s Center in Oakland has organized many recent marches for economic justice. These marches have brought together homeless seniors, schoolchildren, religious activists, teachers, and housing advocates — and, fittingly, the marchers were led every step of the way by a massive puppet of Martin Luther King, Jr., crafted by homeless seniors at St. Mary’s in loving tribute. 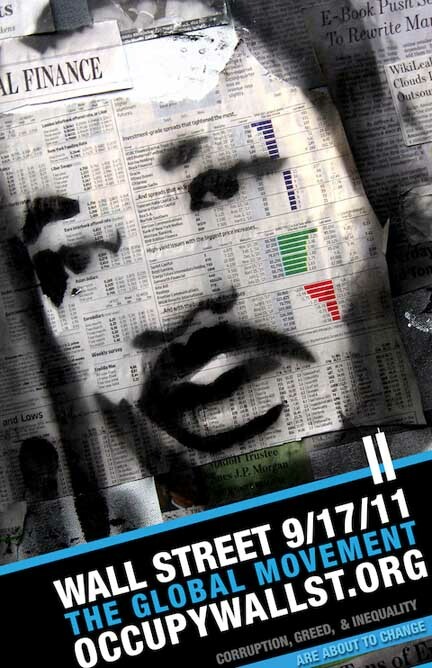 The Occupy movement was an astonishing eruption of energy that greatly surprised everyone who thought that the vision of a massive uprising for economic justice was a dream that had lived and died with Martin Luther King. The fiery dedication and inspiring numbers of people on the move in the Occupy movement awakened the nation to the reality that tens of thousands are ready, willing and able to confront the big banks, the multinational corporations and the wealthy elites with uncompromising demands for justice for everyone. Occupy activists who shut down the Port of Oakland and created people power encampments in hundreds of cities succeeded in presenting a previously unimaginable challenge to the multinational corporations and to the federal government. The signs carried by those marchers carried forward King’s prophetic denunciation of the unjust, interlocking power of corporations, banks, and a government controlled by the oligarchy. Sometimes, in the midst of those protest marches, a feeling springs up unawares, a feeling that Martin’s last dream can never die. His visionary dream of a Poor People’s Campaign remains an unsurpassed blueprint for the edifice of human rights we are still waiting to construct — a resurrection of the Dream. EDITOR’S NOTE: Terry Messman is the editor and designer of Street Spirit, a street newspaper published by the American Friends Service Committee and sold by homeless vendors in Berkeley, Oakland, and Santa Cruz, California; he is also editor of the website with the same name. Please consult his author’s page for further information, by clicking on the byline. Article courtesy of Terry and Street Spirit.